Should you celebrate when your dividend paying company is about to be acquired? I do not like it, when my dividend paying companies are acquisition targets. Last week, shares of Hershey (HSY) increased to an all-time high of $117, because of news that Mondelez (MDLZ) will try to acquire the company. Many investors were happy from the one-time pop in the stock price. I myself was not overly enthusiastic. In this article, I will outline my reasoning behind this. I will also use factual examples in order to illustrate my point. As a dividend growth investor, my goal is to buy shares in a company that exhibits certain attributes such as a wide moat, a track record of annual dividend increases and an attractive valuation. I spend a lot of my time upfront, in order to find, research and buy those ideas at the right valuation. My intention is to hold on to such a company for decades. Therefore, for this one time effort, I end up generating dividends for decades to come. Unfortunately, things in life and business do not proceed in a linear fashion. Some of the companies I purchase for my diversified portfolio end up cutting dividends. I sell as a result of this. The other problem I have experienced occurs when quality companies with a lot of potential get acquired. On the surface, everyone looks happy, because the shareholders can sell their stock at a premium to the going rate. Unfortunately, an acquisition could force shareholders to lock in losses if they paid too high of a price, or force them to pay taxes on capital gains. I do not like those odds. This is because I get a one-time boost to my net worth when my shares are acquired, but then I have to find a way to allocate that money intelligently. Whenever a company I own is acquired, I feel like I am robbed from future dividends and capital appreciation. I feel this way, because when someone acquires a quality dividend growth company in its entirety, they do it because they know it earns stable and growing earnings and they expect this to continue. So while I receive a one-time boost to my net worth, I forego all the benefits of this wonderful business from now until the end of time. I have had several companies I owned, which were ultimately acquired. In most of these situations, I received either a combination of cash and stock in the acquirer or just cash. When I receive cash, I have to realize my capital gains and pay taxes on this event. Paying too much in taxes too frequently inhibits the compounding process. This is costly, and would make the shareholder poorer over their lifetime investment career. If I receive stock, I usually hold on to it. Of course, now I have to decide if the acquiring company is a quality one worth holding on to. Under most scenarios I hold on to the stock of the acquirer. The other problem with acquisitions involves situations where long-term shareholders are forced to take a loss on their investment. One example includes the situation where you purchased shares in a company at inflated valuations, because you believed that the firms long-term prospects justify the high valuations. The risk you are taking is that the company performs as expected, but the valuation multiple contracts. As a result, you do not generate much in terms of profits. To add insult to injury, someone steps in and acquires the stock you own at a higher price. The problem could be that the higher price is lower than the price from the time of your purchase. Another problem could be that the shares are worth roughly what you paid for them one or two decades ago. This is one of the reasons I learned from studying history. This is one of the many reasons why I won’t pay more than 20 times earnings for a company’s stock. I think that now is time to discuss several examples. For example, this is not the first time that Hershey is subject to takeover. Back in 2002, the company was in talks to be acquired by Wm Wrigley for $12.5 billion in cash and stock. The offer price was $42.50/share ( this price was adjusted for the 2:1 stock split from 2004). The company was on track to earn $1.46/share in 2002, and it paid 64 cents/share. The share price jumped from $28.68/share to $39.36/share as a result. The all-time-high was at $38.19/share, achieved in April 1998. The company earned $1.17/share in 1998 and paid a total dividend of 46 cents/share. As you can see, people who bought Hershey stock in 1998 overpaid massively for it at over 30 times earnings and an yield of a little over 1%. They could only barely eke out a return only if the full value of the company was realized when it was acquired by a competitor in full. However, the board of trustees of Hershey Trust rejected the offer, after a lot of public pressure. Hershey Trust owns approximately one-third of the company, but has over three-quarters of the voting power, due to the fact that their stock has preferential voting power. Right now, the trust owns 12.7 million A shares and 60.60 million B shares. The total number of shares is roughly 216 million. Holders of the Class B stock have 10 votes per share. The trust uses dividends to fund charitable activities. As a perpetual institution, they are not interested in maximizing short-term gains, at the expense of foregoing long-term gains. However, they did seem interested in diversifying their endowment in 2002, per the NY Times article linked above. In hindsight, selling would have been a major mistake for Hershey Trust. The stock has almost tripled from the highs in 2002. In addition, the trust collected $18.67/share in dividends since the end of 2002. An investor who purchased the stock at the highs for 2002, would have recovered more than half of their initial purchase price with dividends alone. In addition to that, their stockholdings are worth almost three times as much too. In fact, a $1000 investment in Hershey stock at the end of July 2002 would have turned into $3,960 by the beginning of July 2016 ( with dividend reinvestment). It makes sense that the current offer of $107/share by Mondelez will be rejected. Now that I think about it, even $120/share may be undervaluing the business, relative to its long-term prospects. As an individual investor, I would not pay more than 20 times earnings for a company. If I were buying the whole business however, I would gladly pay 30 times earnings for it. I would then finance the whole thing with cheap debt at fixed long-term rates, and grow my net worth as the company grows and pays off the loan over time. Either way, it is important to avoid buying an overvalued company stock. Back at the beginning of 2015, there were quite a lot of investors I follow, who started acquiring the stock around $108 - $111/share. They did that after missing out on the gains for years. When you start feeling that you are missing out on a stock after it has gained a lot, you need to stop and think for a second why do you want to chase the stock, regardless of valuation. As I reviewed the situation in early 2015, I determined that buying Hershey would provide investors with low returns for the first decade. However, buying the stock below $90/share would provide a better opportunity for investors. If the company continues growing, the highest returns would be realized for those holding for at least two decades. Unfortunately, if the stock is acquired today, and you get cash and stock for your rightful claim to Hersheys future earnings and dividends, you won’t earn the returns you assumed. This analysis puts in perspective the fact that the acquisition of a quality company like Hershey is robbing you, the shareholder of Hershey, from long-term dividend growth and share price appreciation. If Hershey sold itself at the original offer price of $107/share, those who bought the stock in early 2015 would have not fared that well. The price of $107 was essentially the price that the company could have fetched in a sale of the whole business to a private owner. As an individual shareholder, this is too high of a price to pay. I would not pay more than $85/share for Hershey stock at this moment. This is equivalent to 20 times expected earnings of $4.25/share for 2016. Let’s illustrate the potential destruction of shareholder wealth with another example. But this time, I will use a longer term time frame. Back in March 1980, McCormick (MKC) rejected the takeover from Swiss Pharmaceuticals Company Sandoz Ltd. At the time, McCormick had sales of $457 million per year, and net income of $19 million. The business was valued at roughly $320 million. Ownership was divided between 11.371 million shares. Luckily for shareholders, McCormick was able to reject the acquisition offer. This dividend champion has managed to reward patient long-term shareholders with a dividend increase for the past 30 years in a row. The company has managed to boost annual dividends almost 50 fold since 1980. Back when the offer was rejected however, the stock fell by 50% as a result of that however between August 1980 and December 1980. Seeing your stock holdings decline from $2.05 to $1 in less than 5 months is scary. But this was a short-term fluctuation in the grand scheme of things. As Charlie Munger says, “If you are not able to sit through a 50% correction in your stockholdings, you deserve the mediocre performance that you get”. An investor who bought at the highs from 1980, and held on, while spending their dividends every quarter, is generating an yield on cost of over 85%. This means that almost every single year, the shareholder gets their cost basis returned to them in the form of dividends. 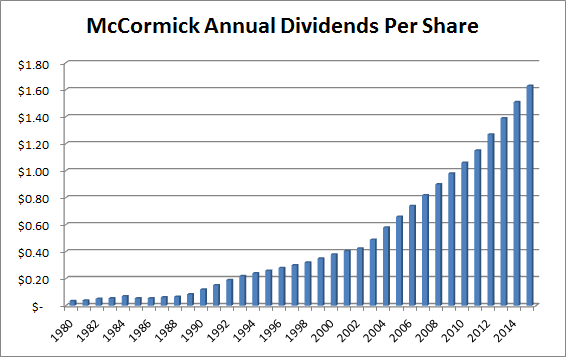 This example illustrates the power of long-term dividend investing in quality companies such as McCormick (MKC). Many long-term investors will likely get a similar high yield on cost if they patiently stick to their portfolio investments, and let them compound on their own for the next 20 - 30 years. In 2015, the company generated almost $4.3 billion in annual revenues, and a net income of $almost $402 million. The company’s ownership was dividend between 129, 200,000 shares. Long-term investors, who stuck with the company, reaped the benefits of ownership, as the stock has gone up more than 100 times during the next 36 years. And I am not even including the power of reinvested dividends.